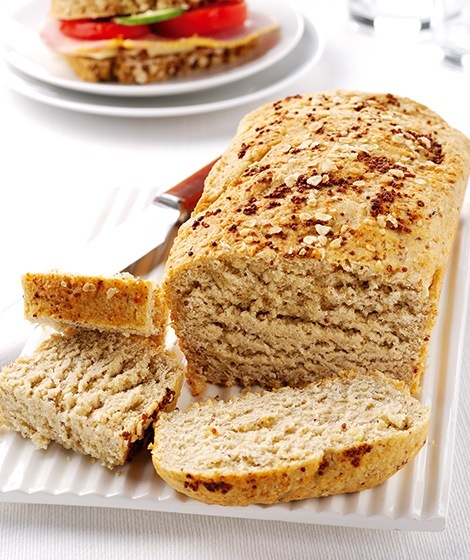 This savoury bread's flavour is delicious and perfect for sandwiches, for toasting, or for topping for a lunchtime snack. Put 100g of the oats in a food processor and blend until finely ground. Tip into a bowl and add the remaining oats and flour. Stir in the yeast, celery salt and cheese. Mix the mustard with 270ml hand hot water and add to the bowl. Using a round bladed knife, mix to a soft dough, adding a little more water if the dough feels dry. Turn out onto a floured surface and knead for 10 minutes. Transfer to a lightly oiled bowl, cover with clingfilm and leave to rise in a warm place until doubled in size, about 1½ hours. Preheat the oven to 200°C, gas mark 6. Grease a 900g loaf tin. Punch the dough to deflate and turn out onto the work surface. Shape into an oblong and drop into the tin. Cover with greased clingfilm and leave in a warm place for about 1 hour until the dough fills the tin. Mix the teaspoon of mustard with 1 teaspoon water and brush gently over the dough. Scatter with extra oats and bake for 35-40 minutes or until pale golden. Leave to cool on a wire rack. Try a small handful of finely chopped herbs such as chives, parsley or coriander, or a few slices of Serrano or Parma ham, finely chopped.